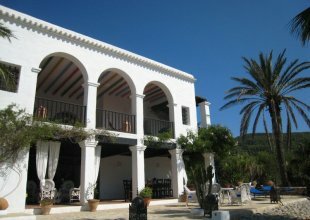 Villa Serena is a truly stunning villa of 712sqm located in a very peaceful and private hilltop location above Es Cubells. The fully enclosed plot extends to 34,000sqm and offers spectacular 200 degree views across the sea to Es Vedra, Formentera and the Spanish mainland. Villa Serena is an amazing place to spend time with family and friends to relax and unwind. A few kilometres from the villa is the famous beach of Cala D'Hort and within 10km of the villas are the beaches of Cala Carbo and Cala Vadella. Ibiza town is approximately a 15-20 minute drive from the villa. The accommodation is divided into 3 parts, the main house and 2 annexes with most bedrooms benefiting from beautiful sea views. Large living room with fireplace and large-screen TV. Dining room for 12 people. Large fully equipped American style kitchen with Miele, Smeg and Krups high quality appliances. The living room, dining room and kitchen all open up onto the terraces and pool. Stunning master bedroom suite including a full ensuite bathroom and a private terrace with chill out bed, telescope and cicloestatic bicycle. 4 further double bedrooms with ensuite bathrooms. Annex 1: 2 double bedrooms which share one bathroom with a shower. Annex 2: 1 double bedroom with an ensuite bathroom. This bedroom also has an Domtik automation system to open curtains and an LED lighting system. The villa has extensive outside space including a large pool terrace offering the most spectacular views of the dramatic sunrises and sunsets. The large swimming pool is 68m2 and there are pool toys available for the children. There are also swings and a trampoline. In addition to this there are four exterior chill out areas, several large terraces and an exterior covered dining place for 12 people.